3)4G LTE Filter: built into all ANTOP amplified TV antennas, blocks 3G and 4G wireless signals for noise-free digital reception. 4)High Gain reception technology, shielded for minimum interference. 5)Durable exterior, waterproof design with UV coating. 6)Supports VHF / UHF digital signals. - Scan channel monthly to find all available channels including newly added or changed. - Keep the antenna away from any high power consumption devices to avoid interference, such as air-condition, power station, elevator etc. ✅【360 ° OMNI-DIRECTIONAL RECEPTION】Excellent non-adjustment reception from various signal origination locationgs. Enhance VHF signal reception, like NBC,ABC,etc. Assuring you more channel reception and less blind spots,like CBS, Fox, The CW, and PBS,etc. ✅【SMARTPASS AMPLIFIER】Exclusive ANTOP technology, uses an all-in-one design allowing easier adjust the balance between short and long range reception. Build in 4G LTE Filter blocks 3G and 4G wireless signals for noise-free digital reception.15in DISC SIZE ensures large signal reception range and provides highest quality pictures. 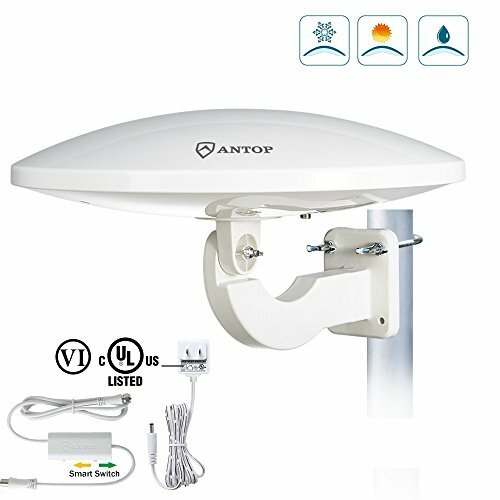 ✅【WATERPROOF & ANTI-UV】Get better signal reliability on windy or rainy day and unti-UV coating and provides visual appeal.Fit Home/RV/Attic/Marine Use. ✅【CUT THE CORD】There is no monthly fee and no need to subscribe.No more expensive cable or satellite fees, saving 1,000 a year. Just plug to TV,scan channel,then enjoy your TV shows! Receives all of your local news, sports, kids, weather, etc, absolutely FREE. Come with 1 YEAR WARRANTY & 30-DAY MONEY BACK GUARANTEE.